It all started when anthropologist Andreas Lloyd (University of Copenhagen) was browsing on the Internet looking for a new laptop computer and ended up installing the free Windows alternative Linux. 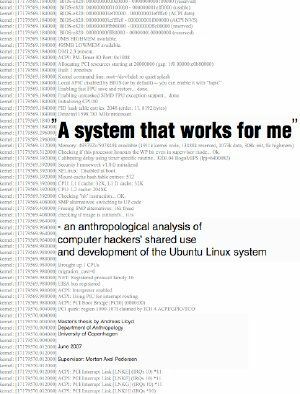 Two years later, he finished his master thesis “A system that works for me” - an anthropological analysis of computer hackers’ shared use and development of the Ubuntu Linux system. Based on more than 2 years of daily use of the Ubuntu Linux system and 6 months of online and in-person fieldwork among the developers working to develop and maintain it, this thesis examines the individual and collaborative day-to-day practices of these developers as they relate to the computer operating system that is the result of their labour. A group of Spanish computer scientists measured the size of a Linux system similar to Ubuntu, and found that it contained around 230 million lines of source code. When they translated this into the effort spent on writing this code using a standard software industry cost estimate model, they found that it would correspond to almost 60.000 man-years of work (Amor-Iglesias et. al. 2005). By comparison, it took an estimated 3.500 man-years to build the Empire State Building in New York, and 10.000 man-years to build the Panama Canal. This immense effort makes modern operating systems such as Ubuntu among the biggest and most complex engineering projects ever conceived and built. So the anthropologist was curious to learn more about how the hackers collaborate to build such an intricate system, and to learn why they were doing all of this work just to give it away for free. I joined the Ubuntu on-line community on the same terms as the Ubuntu hackers, contributing to and using the same system, sharing their experiences with the system, and meeting them in-person on the same terms as they do at the conferences at which they gather, experiencing the same social and technical means and limitations through which they develop the system. In order to do participant observation in this on-line space, I began contributing to the system by writing the system help and documentation, rather than the system itself due to my lack of technical understanding. In this way, I could take part in shaping Ubuntu alongside other community members while slowly developing a feel for the everyday exchanges and work in the community. In the true digital spirit of this work, I dedicate this thesis to Rosinante, the laptop on which I first experienced the Ubuntu system, and which was my faithful companion during my fieldwork and the writing of this thesis, only to bow out a week before tsafe for so long. Open Source Fieldwork! Show how you work! Open Source Anthropology : Are anthropologists serious about sharing knowledge? 2006 - The Year of Open Access Anthropology?